The Ecosun G is a glass infrared radiator suitable for both wall and ceiling mounting. The glass heating panel has a perimeter frame in anodised aluminium, with a matt silver finish. This gives the panel a modern yet elegant appearance suitable for both domestic and commercial properties. The front panel is made from safety glass and is available in white, black or mirror effect. 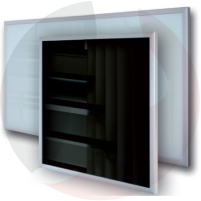 This framed glass infrared radiator will compliment or enhance any interior. Ecosun Glass radiators are designed to work with our range of underfloor heating thermostats.